Introducing The Valentines. Fame – It Runs in the Family! Sisters Hope, Faith and Mercy have everything: fame, success, money and beauty. But what Hope wants most of all is love, and it doesn’t matter how far she has to go to find it. Except real-life isn't like the movies. Even if you're a Valentine . . . 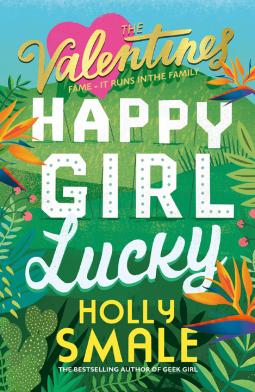 Happy Girl Lucky is the first hilarious, heart-warming book in The Valentines series. 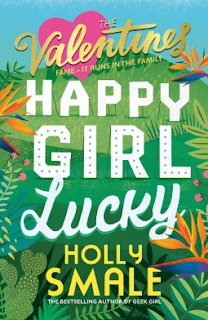 Review: Ok going into this novel I had certain expectations because I am a HUGE fan of the Geek Girl series by Holly Smale and when someone has had a series that successful, it is definitely a tough act to follow. But wow I loved this book. It was such a great pick for when I read it because I needed something that would make me laugh and keep me entertained for 400 pages. Hope is a great main character and I really really can't wait to hear how she gets on as we progress through this series. She has the endearing ditziness of Harriet Manners but T the same time she feels like she knows it all and she is going to be an absolute star, what a great mix! Her siblings are also thoroughly entertaining. They each have very different qualities and they just work well at causing friction and yet at the same time a kind of harmony within the family. I also loved the setting of this novel, being set between Richmond and Hollywood makes it easy to relate to, they are covered well in the media and they really couldn't be more different! There is a strong message of being yourself and self-acceptance in this book and also a subtext of not being in too much of a hurry to grow up. There was a little family drama, a touch o romance and a sprinkling of old Hollywood that just made me fall in love and I can't wait to hear more from Holly Smale and continue on in this series!